Man with a beard trying to run! So you've found my blog, well done! I hope you enjoy my journey in my efforts to try and become a better runner! This goes down as the hardest run I have ever had!! And it wasn’t just the heat! 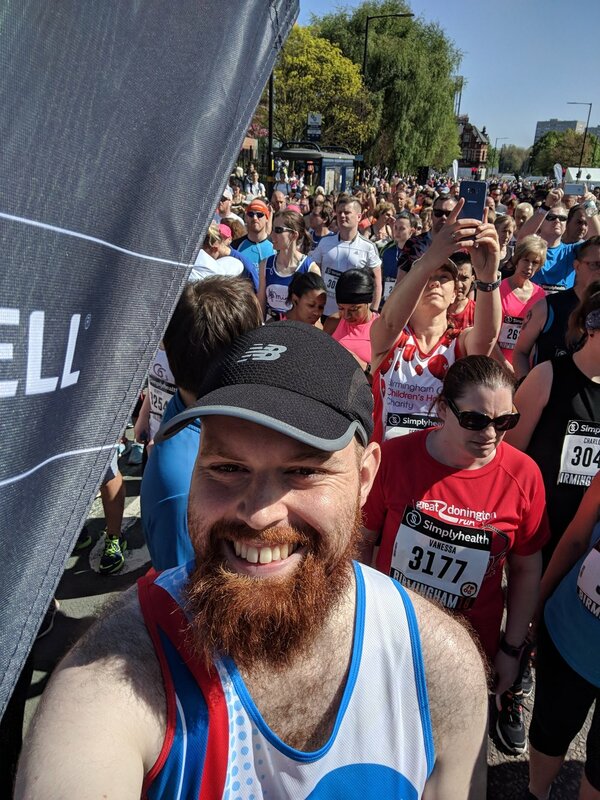 I signed up for the Birmingham 10k awhile ago now, it was a choice between running this or going to watch Middlesbrough in the last game of the season at Ipswich! Luckily for me our season we managed to secure the playoffs the week before (but the Ipswich game was a cracker!). I knew that wasn’t an option, but it felt like the best one for a few minutes. Instead I found a quiet area to do some stretching and try and block everything out! Luckily once I got to the start line I just concentrated on the running. Onto the running then, I was trying to keep up with the 55 minute pacer for as long as I could, I managed it for the first few miles but the heat started to get to me pretty bad! My spirits lifted as I hit mile 3 and saw my lovely girlfriend and her parents and also the great people at Kings Heath Running club as I came through cannon hill park. I hit mile 4 and waved goodbye to the 55 minute pacer off into the sun/tarmac and concentrated on just doing the best I could. The last few miles were tough, I took on some water and threw the rest over my neck and took my time through the showers! In the end I managed a PB of just under 56 minutes so was chuffed with that! My goal of a sub 2 hour marathon is definitely feeling more doable now, as long as the heat stays down! I met my girlfriend and her family for an amazing burger (get down to OPM if you're in Brum!) and some beer! All in all it was a good race, not the best of courses but lots of people cheering and kids with water guns which was much appreciated! A bit about the charity I am running for, rethink mental illness are a great charity who help out anybody and everybody who suffers from any type of mental health issues. Among lots of other things they man phone lines which are there in peoples hardest times and get out and actively help people with mental health issues. Suffering with that anxiety at the beginning of the race made me realise at times when you least expect it, it can hit you. It’s cliché to say it but running has really helped me clear my mind at times when I need it. Running has given me a focus, helped me lose weight and most importantly has genuinely made me a happier person! If you want to donate to such a great cause and help me achieve my goal leading up to the Great North Run you can do here.